Thank you all for your comments! I've been gradually getting used to the little beastie of a keyboard and I actually like it better each day. It's just right for simply typing text. 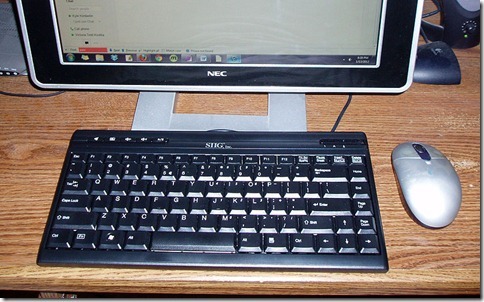 The keys are fairly quick and responsive, considering how little I paid for it.There are a few things I miss though; e.g., no wrist rest, no mute button, a Delete key that's small and somewhat distant from the action, and no separation of the F keys from the numeric row.So, not perfect but not bad. A respectable writing tool. P.S. My right arm , wrist and shoulder became so damaged in just a couple of years that I never could use a mouse again and only can work on a laptop with a pad. 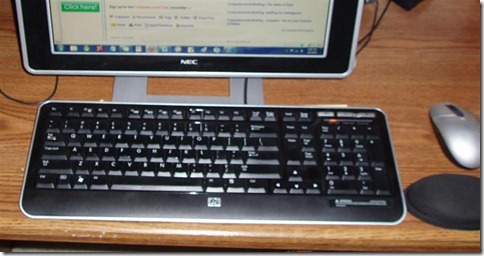 Really good to know that you experts have found a solution to the notorious keyboard problem. I fought with the computer experts at Edward Jones Co. for years before I quit working for them. They said they couldn't make a change because some writers in thecompany needed the keys the way they were and they wouldn't do anything different for any one office. Everybody had to be the same. That is thousands of offices accross the country and the British Isles.In general the computer experts when replacing the typewriter were unwilling TO SEE the engineering and ergomonics that went into the old keyboard. Such is life…as we reinvent the wheel.Congratulations and thanks fordiscussing in your blog. Sometimes happiness arrives in a 12.5-inch bundle of black joy. So long as you're delighted, that's what matters.I love my 10-key number pad. Can't live without it. I do all my number-punching with it. Drives me nuts on my laptop to have to hunt the horizontal for the correct digit as I've gotten so used to them being all collected for my sightless pleasure.I also use a trackball pointing device, not a standard mouse. It it has to move, I've no use for it. My thumb is the happy master of my cybernavigation.One thing I did notice about your set up, my friend: Your desk is far too clean and uncluttered. You do know what that says about your mind, don't you? I rest my 1.5-yard keyboard.